Summer is officially here! That means warmer weather, longer days and, for most of us, enjoyable family gatherings, picnics, barbecues and vacations. If you have a parent with dementia, you may have a tendency to exclude them from many of your festivities. It’s a natural reaction, as you are concerned about their well being and want to avoid any unnecessary anxiety or safety risks. While safety and health are important, you may be able to enjoy more time together with mom or dad than you think you can. By planning in advance and taking time to prepare them, they can participate in outings and family gatherings. Here are some tips and ideas to help make it easier to include mom or dad in more of your summer activities. Sun exposure can be dangerous. Make sure you apply sunscreen to exposed skin. Sunglasses, hats and visors are good ways to keep sun off the face and out of the eyes. Have them dress lightly. Encourage clothing that is comfortable and lightweight. Stay hydrated. Always have a glass or bottle of water handy and make sure that your mom or dad is drinking regularly. Plan enjoyable activities and prepare in advance. Avoid crowds and events with loud noises. That includes fireworks, which can be particularly unsettling for someone with dementia. If your loved one has always enjoyed a nice swim, they can continue to cool off in the pool. However, never let them go unsupervised. Make sure someone is there in the water with them and that they are always able to quickly exit the pool if necessary. Gardening in warm weather can be fun and therapeutic. Try to keep your gardening activities to morning hours to avoid exposure to afternoon sun. Make sure that no sharp tools, such as garden shears are left nearby without supervision. Also make sure that fertilizers are kept hidden so as to avoid accidental swallowing. 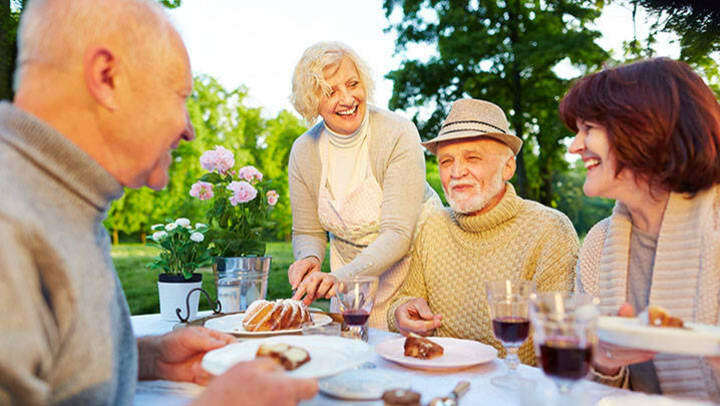 Family gatherings are fun but can be noisy and, therefore, cause added anxiety to someone with dementia. Make sure your loved one has a quiet resting place to sit where individual family members and friends can visit for short periods of time. Vacations in unfamiliar surroundings can also cause anxiety for those struggling with dementia. You must decide if the benefits outweigh the potential negatives. You may want to consider short-term “respite” care for your loved one to enable you and your family to relax without worry. It also gives your loved one an opportunity to see, first hand, what a memory care community is like. Summer can be a fun, relaxing time for family, friends and, yes, also for your loved one with dementia. Try to include mom or dad whenever possible. By taking some precautions and making some adjustments, they, too, can continue to enjoy these lovely summer days.